↑ Land areas and population estimates are taken from The 2008 World Factbook which currently uses July 2007 data, unless otherwise noted. ↑ ၃.၀ ၃.၁ ၃.၂ ၃.၃ Since Guadeloupe and Martinique have been upgraded from overseas departments to regions of France, they are no longer listed separately in The World Factbook. Therefore, these figures are from the last edition in which they appear -- July 2006. 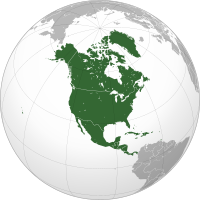 ↑ ၄.၀ ၄.၁ ၄.၂ Depending on definitions, Aruba, Netherlands Antilles, Panama, and Trinidad and Tobago have territory in one or both of North and South America. ↑ ၆.၀ ၆.၁ Water area makes up a considerable portion of this entity's total area. Therefore, for a more accurate figure on which to calculate population density, this figure includes land area and excludes water area. ↑ Due to ongoing activity of the Soufriere Hills volcano beginning 1995, much of Plymouth's de jure capital was destroyed and government offices were relocated to Brades.